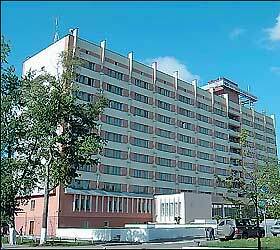 The "Spasskaya" Hotel has existed since 1990. In the Vologda region, it occupies a leading position in the hospitality sector. One of the main tasks of the enterprise considers the provision of a wide range of services to the European level: the increased comfort of accommodation, catering and leisure facilities. The "Spasskaya" Hotel offers more than 200 guest rooms of different categories. Most of them are of high comfort. Guest Room Amenities: direct dial telephone, a colour television, refrigerator, tea/coffee facilities upon request. The right place for very special party whether it is a small retirement or a large function, a business meeting or a romantic rendez-vous, a wedding party or even a party for children. The interior of the night club "TNT" is visually divided into three parts. The area close to the dance floor is for spectacle and hot dance lovers. The two flank parts are for those who like to socialize. All the best is just for guests: the renewed stylish interior of TNT, the best dance music, and an amazing choice of food and drinks. This is a special world for those who like following the beat of the night city. Every night is different and has its own theme program. The hotel offers its customers a wide choice of extra services: car parking with a security, a sauna, a service-center, hairdresser`s, a gift kiosk, a beauty parlour, solarium, a left-luggage office, a conference room, a laundry.